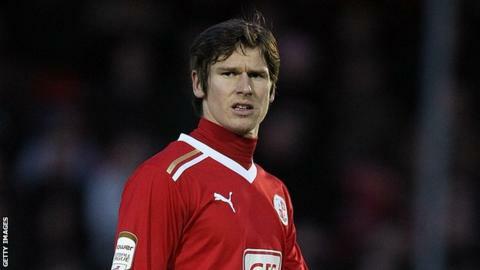 Crawley Town midfielder Josh Simpson says he is delighted to have been appointed as club captain. The 25-year-old has assumed the role at the League One side on a permanent basis after Gary Alexander joined AFC Wimbledon last month. He told BBC Sussex: "It's always an honour to be given the captaincy. "It gives you that spring in your step when you go on the pitch. I'm not the most vocal but I like to try and lead the team as I can by my performances." He added: "The gaffer [Richie Barker] asked me if I wanted it and I took it with open arms." Reds boss Barker remodelled his squad in the transfer window, brining in younger players to replace players such as Claude Davis,Michel Kuipers and Alexander, and Simpson is looking forward to the added responsibility. "I'm only 25 and I'm one of the most experienced in the team," he continued. "We've got a young squad now but it's great and I'm looking forward to helping other players if I can. "We've got 18 games left and I'm looking forward to leading them. "The boys that have come in have gelled nicely and I'm looking forward to seeing what they can offer." The Reds, who have won back-to-back promotions, currently sit 15th in the table but are only six points off the play-off places. Due to postponements the West Sussex club have as many as three games in hand on some of the teams above them and the former Peterborough man has called on the squad to finish the season strongly in a bid to keep their hopes of an unprecedented third straight promotion alive. "We need to win our games in hand," Simpson said. "The last third of the season is tough and we need to pull together. "Hopefully we can do what we want to do and get into the play-offs. It shows the expectations of us and the club itself." Meanwhile, on-loan striker Jimmy Spencer has had his loan spell at the Broadfield Stadium cut short by a knee injury. The 21-year-old Huddersfield player joined until the end of the season in the January window but Crawley have decided to terminate the agreement.